Here is Manhattan at its exciting best. 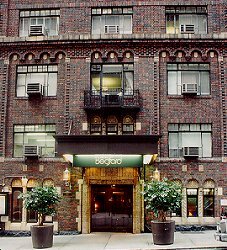 Located on 40th Street between Park and Lexington Avenues, the Bedford is in the heart of mid town Manhattan, where the business district meets the gentler Murray Hill area. The hotel's prime location in the hub of New York makes it convenient to corporate offices, Broadway and its theaters, and Grand Central Station. Also located within an easy walk are such attractions as Rockefeller Center, St. Patrick's Cathedral, the United Nations, Lord and Taylor Department Store and Fifth Avenue shopping. At the Bedford you will enjoy the attentive service and warm atmosphere of a small European hotel with a friendly multi-lingual staff to attend to your every need. Every room has cable TV, air conditioning, dataport telephone, Corby trouser press, private bath with hair dryer, in-room safe, iron and board. Most accommodations come with complete kitchenettes. SPECIAL INTERNET RATES starting at $155. This and other Hotels in New York City can be found here in The Register.